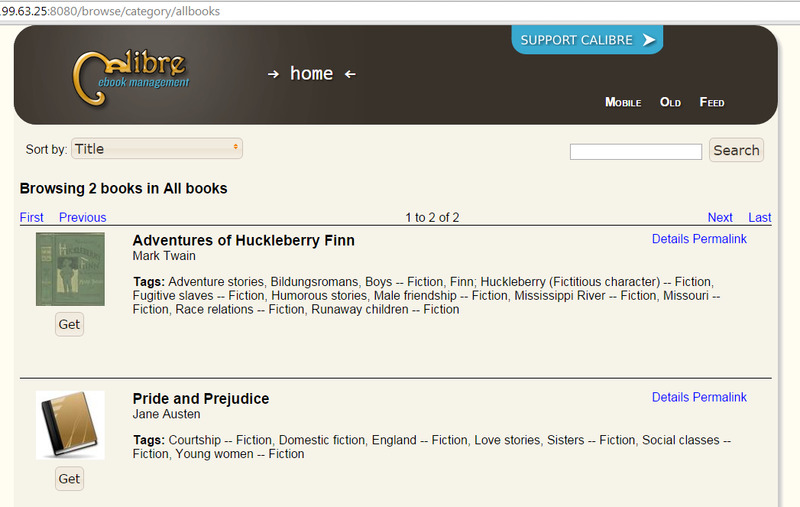 Calibre is a free and open source ebook manager. Although Calibre is probably better known for its desktop client, it can also act as a powerful server, allowing you to access your ebooks from anywhere in the world (or share your collection with friends). Keeping your ebooks on a server is great, as you aren't reliant on having the same reading device with you whenever you want to read. And if you go traveling, you don't need to worry about taking your ebook collection with you! The server includes a simple and elegant browser front-end that allows you to search for and download books from your library. It also has a mobile-friendly site built in, making it easy to download books straight to an e-reader – even to ones with only the most basic web functionality. For example, Calibre's browser works with the Kindle Touch, which can download books directly even though the device only has an e-ink display and an experimental browser. In this article we'll look at how to install, set up, and use Calibre on a Ubuntu 14.04 server. We'll also take a look at how to use the calibredb command to create, customize, and maintain your ebook database right from the server. By the end of this tutorial, you'll have a small initial library to which you can easily add new books! Examples in this tutorial are shown for a virtual or physical machine running a fresh installation of Ubuntu 14.04, but they should be easily adaptable to other operating systems. Calibre is available from the APT software repositories, but as advised by its creators it is far better to install from the binaries provided on their website. Calibre is updated very frequently and the version in the repos tends to lag behind. Luckily, the creators of Calibre have made this very simple to do. Just run the following Python command on your server. Before running the command, please double-check the official Calibre site in case the command has been changed. You will notice some warnings about failed desktop integration, but these are safe to ignore, since you are installing Calibre on a remote server. The Calibre command line tool calibredb is used for various operations on your Calibre library, such as adding or importing books, and fetching metadata and covers for books. We'll take a look at how to use some of these commands later, but for now we'll just install two dependencies. The first is ImageMagick, without which calibredb won't run; and the second is xvfb which we'll use to run calibredb in a virtual X display server – in order to sidestep issues caused by running Calibre in a non-display environment. To install these just run the following commands. Now we're almost ready to start running the server. We need to get some books to serve, however. You may well have your own ebook library already, so we'll look at two ways of doing this. We've created two directories: the first, ~/calibre-library is the one that Calibre will organize automatically, while we'll add books manually to the toadd sub-directory. Later, we'll take a look at how to automate this process too. How we'll grab some books from Project Gutenberg. For this tutorial we'll download Pride and Prejudice by Jane Austen and A Christmas Carol by Charles Dickens. Change to the toadd directory to get started. Calibre relies somewhat on file extensions to correctly add books, so the -O flag in the wget command specifies a more friendly filename. If you downloaded a different format from Gutenberg (such as .epub) then you need to change the file extension accordingly. The asterisk means that Calibre will add all books found in the toadd directory to the library, in the calibre-library directory. You might see an error about not finding a cover (we chose to download the .mobi files without images), but you should also see confirmation that the books were added to the Calibre database. Replace your_server_ip with your Ubuntu machine IP address. You should see the main page of your library, looking similar to the screenshot below. If you click on the All books link, you should see the two books that we added earlier. You can click on the Get button below either book to download it. If you're already running the desktop version of Calibre and already have your library set up, you can import it to your server easily. Double-check your current library folder for a file called metadata.db. If this file exists, then everything should just work without any additional configuration. Upload your entire library folder to your server. This will add your existing library in its entirety to the server. You can add more books to it on the server by placing the book files in the toadd directory, as explained in this tutorial. We don't really want to keep a shell open with the calibre-server command running in it just to keep the server running. While we could add the --daemonize flag to the command, there are better ways to do it. Below we'll look at how easy it is to make calibre-server into a service so that it will automatically start on system reboot and so that we can very easily start, stop, or restart the process. If the server is still running, hit CTRL + C in your terminal to stop it. 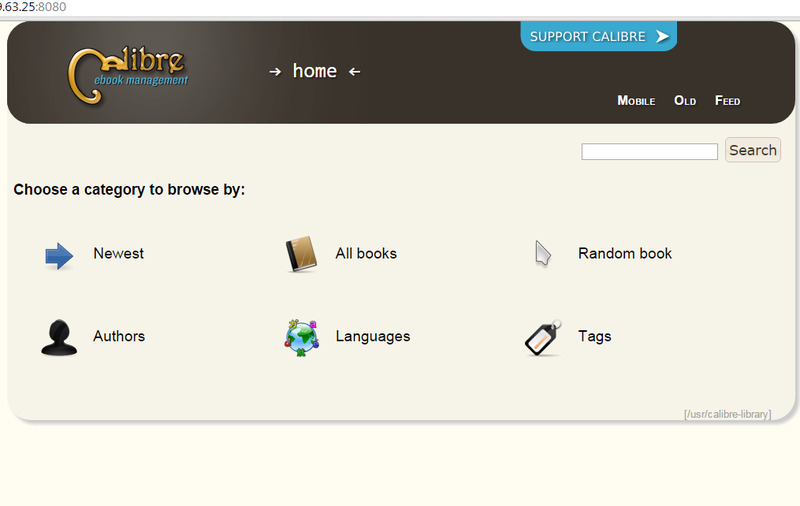 description "Calibre (ebook manager) content server"
Now use a browser to navigate to your server's IP address or domain name. You should see a popup form asking for the username and password. These should be the ones you added to the Upstart script. Enter these and you'll be taken to your ebook library as before. This makes managing the server a lot easier than having to manually deal with daemon processes and process IDs! The site by default has a mobile version that works nicely with smaller-screen devices such as phones and e-readers. This should load automatically if you visit the site from a mobile device. We can write a simple cron job to watch our toadd directory for new books. Every 10 minutes it will look for files in the /home/user/calibre-library/toadd/ directory, add any files in there to our Calibre database, and then remove the original files. (Calibre makes copies of the files when it adds them to our library so we don't need the originals once the add has taken effect.) This means that if you transfer book files via scp, ssh, etc. to this directory from your main machine, or just download them directly into the toadd directory, then they'll automatically be added to your Calibre database and be available for download from your library! You might have to make a selection about your preferred text editor. The first part of the command (*/10 * * * *) means that the command should be run every ten minutes. The second part is the same as the command we manually ran earlier. It adds all the books from the toadd folder to the database and then removes the original files. That's that. You can now access your ebooks from anywhere in the world. Note: The search results in Calibre aren't sorted by relevance, so if you enter a common term you often find unrelated books before the one you're looking for. However, you can specify to search only by title or author, which does help a lot, and the browse options (browse alphabetically by Author, for example) are very well implemented as well. There are one or two things to keep in mind about running and maintaining a Calibre server. We'll take a brief look at these to finish off.